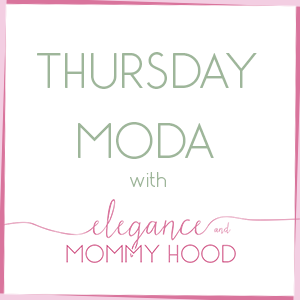 Winter Mom Wear & Thursday Moda Linkup. In my last OOTD post I featured an Olive Green Trench Midi Dress paired with Black Leggings and mentioned the importance of remixing clothes, especially in the Winter where more items and more layers are worn. Today, like promised, I took the same Black Leggings and dressed them down with a dress (as opposed to yesterday where I dressed them up with a dress). Actually today's post is a two-fer which includes more remixing. 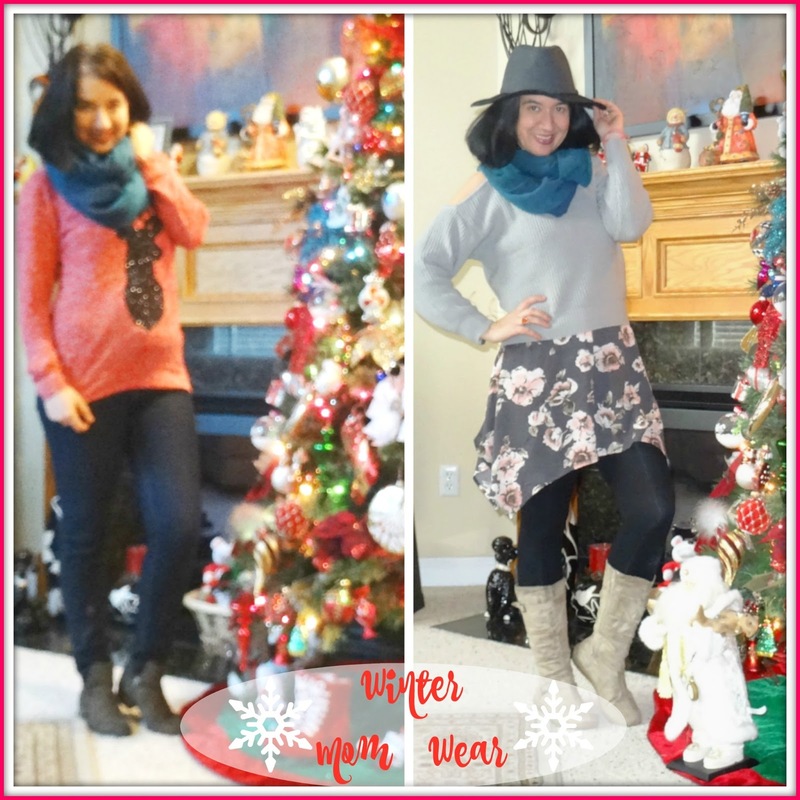 The same Teal Buffalo Plaid Infinity Scarf is worn on both of these Wintery Casual Mom Looks. Both outfits were worn last week on two days off I spent out and about with Vivian. First, I am finally showing this Cold-Shoulder Gray Sweater from Romwe, which just now made it on the blog though I have worn it at least three other times since this but I haven't been able to take photos. I just love this sweater and thanks to Romwe I now own it. 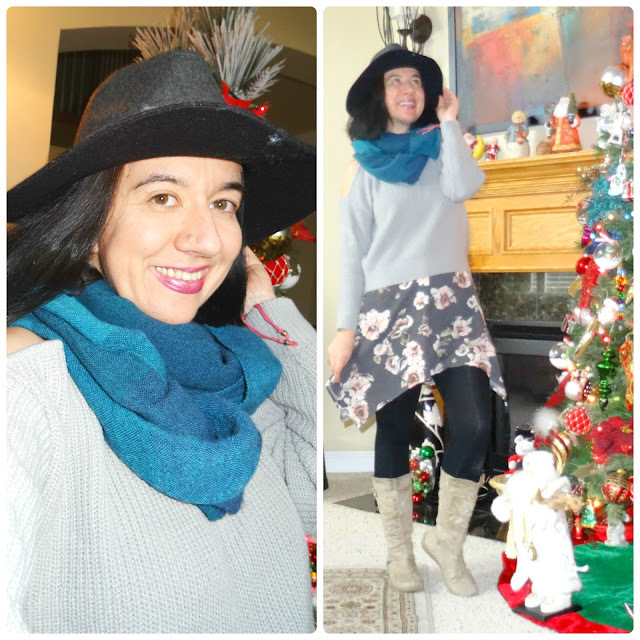 Since I am wearing mostly dresses this Winter I wore it over a Long-Sleeve, Bohemian, Asymmetric-hem, Olive Floral Dress with my Black Leggings underneath, some Taupe Faux Suede Wedge Booties, my Teal Infinity Scarf and a Black+Gray Felt Fedora. I opted for no jewelry since there were a lot of layers in the mix. It ended up being a fun little Bohemian look I wore last Friday where I took Vivian to take photos with Santa Klaus (and she did so well) and did a lot of shopping afterwards together, at the mall. I was warm and felt sassy in this. I added a plum lipstick and some black mascara with a little blush on my cheeks and was good to go. This is another outfit worn on a day spent with my daughter, at an "Olive Garden" lunch-date with Viv and a trip to Target afterwards (with a co-worker) where my sweet Viv wanted everything pink she saw, no matter what it was. It was chilly that morning and wasn't feeling dresses so I wore some Dark Indigo Skinny Denim with this new Red Metallic Marled Sweater I picked from Wal Mart recently. Isn't the reindeer cute?! I rarely shop for clothes at Wal Mart but sometimes one can find gems. 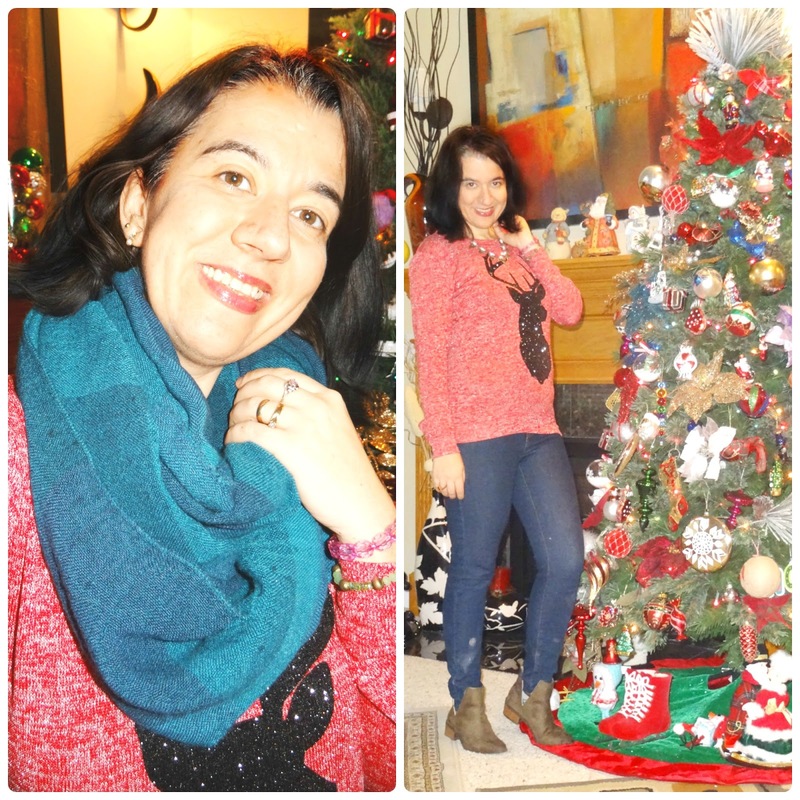 I did dress it up with a Statement Necklace, some Pearl+Crystal Studs and both a Pink and a Green Beaded Bracelet. I finished off with a coat of Coral Lip Stain. The scarf was definitely necessary while outside. 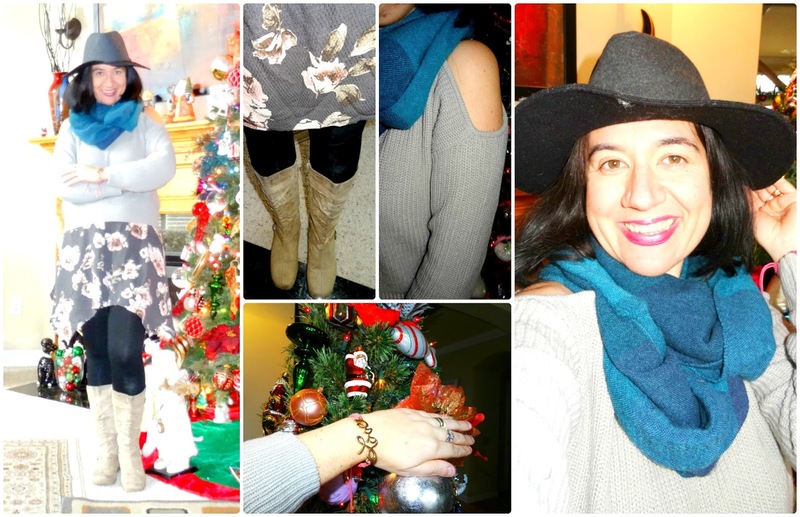 So this is how I layer up and stay warm using an Oversized Infinity Scarf for Casual Mom Wear Winter Days. Of course, cute and cozy sweaters for the win! Which of the two outfits is your favorite?! Ribbed, Cold-Shoulder, Crewneck, Long-Sleeve Gray Sweater: c/o Romwe (identical, comes in many colors and for a steal! ), (quite similar, Steal, love this), (similar sweatshirt), (similar in tan, my Favorite). Gray-ish Olive Rose-Print, Bell-Sleeve Bohemian Asymmetric-Hemmed Dress: Blue Pepper (New) (almost identical), (similar in blue floral, Steal, love this), (similar, short-sleeve option, Fantastic Deal), (similar in olive floral, Great Deal), (similar in black floral, my Favorite). Black + Dark Gray Felt Panama Hat: Forever 21 (similar, Huge Steal, love this), (similar, on Sale), (quite similar, on Sale, my Favorite). Taupe Faux Suede Small Wedge Mid-Calf Boots: Aerosoles (similar knee-length boots, love these), (similar w/ block heels, Small Splurge, my Favorite), (similar cozy flat option, on Huge Sale). 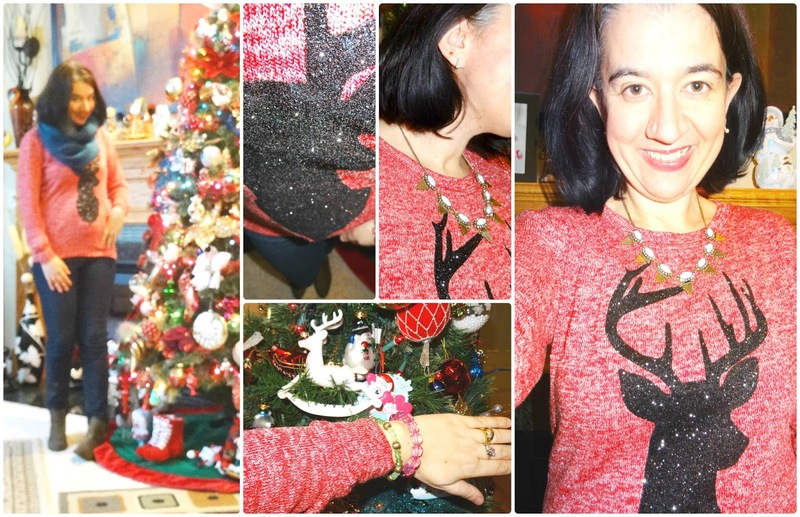 Red Marled Metallic Intarsia Sweater w/ Black Reindeer: Wal Mart (New) (similar, Steal, love this), (my current similar favorite in gray, love this), (fun option w/ many reindeer, Fantastic Deal, my Favorite), (ugly-cute option). Olive, Faux Suede, Open-side Booties: Charlotte Russe (New) (similar, Huge Steal), (similar, on Sale), (similar laceup option, Great Deal, love these), (edgy cut-out style w/ buckles, Small Splurge, my Favorite). I am running really late today and on top of being busy with lots of work, I have the worst headache. 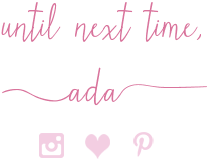 I have no clue the exact time I will publish the Thursday Moda post for this week, but for your convenience the new linkup is on the bottom and you can join it starting at 4.00 PM Eastern time tonight on Wednesday December 14th. Thank you and Happy Hump Day!